All praise is for Allaah; peace and prayers be upon Muhammad his family, his Companions and all those who follow in their footsteps until the Day of Judgement. In the following pages is a short essay by one of the greatest scholars alive today on the merits of knowledge and the characteristics of the scholars. The Shaykh, may Allaah protect him, has beautifully described the importance of seeking knowledge, acting according to it and other related matters. It is hoped that this booklet will help to create a realization of the importance of knowledge and the status of the scholars. This booklet has been published in Arabic under the title: Al-'llm wa Akhlaaqu Ahlihi. The translator, may Allaah reward him has added some useful footnotes and included an appendix containing some very valuable points, taken from the writings of Ibn Qayyim al-Jawziyyah. The author, Shaykh 'Abdul-'Azeez bin 'Abdullaah bin Baaz, may Allaah preserve him, is one of the greatest scholars of this age, who has spent his life calling to the pure Islaam, in creed as well as methodology, as understood by the Companions, the Successors and their successors -may Allaah reward him. Indeed the virtues and merits of knowledge ('ilm) are well known to everyone. It is the most noble thing that one can ask for, and the best thing a seeker can strive to attain. Knowledge consists of many branches, but according to the scholars of Islaam: "What is meant by knowledge in the absolute sense is Islamic knowledge." This is the intended meaning of knowledge in the Book of Allaah and the Sunnah of His Messenger (sallallahu alaihi wasallam). In the absolute sense, it is knowledge regarding Allaah, His names and attributes, knowledge of His rights over His creation, and what He, the One free from all defects, the Most High, has prescribed for them. It is the detailed knowledge of the path that leads to Allaah; knowledge of the purpose of our creation; and the end which the slave will result in, in the Hereafter. This Islamic knowledge is the best of sciences worth acquiring because through it Allaah is recognized and acknowledged, and by it He is worshipped. One who possesses this knowledge knows what Allaah has made lawful for him and what He has prohibited him from; what pleases Him and what evokes His anger. With this knowledge a person knows his result with Allaah and his end. From amongst the people, those who have taken upon themselves to observe the precepts of the Religion will result in Paradise and bliss, and the rest (which are the majority) will result in a place of disgrace, humiliation and misery. The people of knowledge have cautioned us about this and explained that knowledge is confined to this meaning. Amongst the scholars who indicated this is al-Qaadi ibn Abil' Izz 1 (commentator of 'Aqeedatut Tahaawiyyah) at the beginning of his commentary. Others have also referred to it, such as Ibn Qayyim, Shaykh-ul-Islaam Ibn Taymiyyah 2 and a number of others. It is very clear that the merits and virtues of knowledge vary depending on the extent of one's adherence to it. The greatest and most excellent knowledge is that which pertains to Allaah, His names, and His attributes, and this knowledge is known as 'aqeedah (belief). Indeed to Allaah, the Exalted and Supreme, belongs the best example, which is the highest description in every aspect of His essence, names, attributes and actions. Following this is that which is related to Allaah's right over His creation, what He has prescribed upon them. Following this is what supports and bonds it in understanding such as knowledge of the principles of Arabic, Islamic terminology, principles of fiqh, hadeeth methodology and other sciences which are connected to this knowledge, which assist it in both understanding and precision. The biography of the Prophet (sallallahu alaihi wasallam), Islamic history, biography of the narrators of hadeeth and of the scholars of Islaam are also part of this knowledge. The people of knowledge bear witness to His Oneness along with the angels. The angels ('alayhimussalaam) and the people of knowledge, affirm Allaah's Oneness with sincere devotion towards Him, that He is the Lord of the worlds, the true deity worthy of worship and that worship of anyone besides Him is futile and void. Therefore, the people of knowledge and the ignorant are not alike. The person, who has knowledge that what Allaah has revealed is the truth, guidance and a way to success, is not equal to the one who has been blinded to this way and to this knowledge. There is an immense difference between the knowledgeable and the ignorant. It is the difference between one who knows the truth and obtains insight through its light and acts according to its guidance until he meets his Lord achieving success with nobility, and one who is blind to this way and follows his desires taking the path of Shaytaan. The two groups are not similar. Allaah has clearly stated that He raises the ranks of the people of knowledge due to their effect upon the people and the great benefit that people draw from them. Thus some of the people of knowledge have said: "What is more beneficial than their effect upon the people! What is more harmful than the people's effect upon them!" Their beneficial effects upon the people is their directing the people towards righteousness and guiding them to the truth, making sure that the guidance reaches them -and these are great benefits that are derived from them. Allaah 6 thanks them and the believers thank them for their meritorious actions. That is, complete and perfect fear. The scholars have knowledge of Allaah, His names, His attributes and His Sharee'ah, which He dispatched the prophets with. Hence when some people who took the knowledge to which the Messenger of Allaah (sallallahu alaihi wasallam) was guiding to be insufficient and said: "We are not like you O Messenger of Allaah! Allaah has forgiven your past and future sins." The Prophet (sallallahu alaihi wasallam) said: "By Allaah! Indeed I am the one who fears Allaah the most amongst you, and the most pious of 10 you." The scholars are the most fearful of Allaah among mankind due to their knowledge of Allaah, His Deen, His names and His attributes. They are the most eager among men for the truth depending on the extent of their knowledge of Allaah. Further above them and the most perfect are the prophets, as they fear Allaah the most. The most perfect of them, with regard to knowledge, fear and piety, is our Messenger Muhammad (sallallahu alaihi wasallam). There are many ahaadeeth showing the virtues and merits of knowledge. From them is his (sallallahu alaihi wasallam) saying: "Whosoever pursues a path to seek knowledge therein, Allaah will thereby make easy for him a path to Paradise." 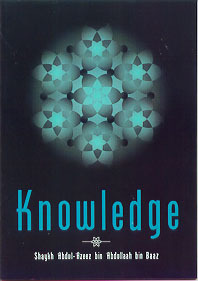 Knowledge should be sought for the right reasons and for its implementation (acting according to the knowledge) not for the sake of ostentation (riyaa') 12 , fame, or for the sake of any other gain from the ephemeral gains of this world; rather, he learns it to be acquainted with his Deen, to have insight into what Allaah has made incumbent upon him, to strive to take the people out of darkness and into the light, so he seeks knowledge and acts upon it and teaches others about the good that a Muslim is ordered to do. Every path that he takes in search of knowledge is a way to Paradise; this is true for every path, literal or otherwise: his journey from one country to another; going from one circle of knowledge to another; and from one mosque to another for the sole intention of seeking knowledge. These are from the ways of acquiring knowledge, likewise memorizing and studying Islamic books of knowledge, perusal and writing are also from the ways of seeking knowledge. This is a great admonition for the person who has an evil intention. It is reported that the Messenger (sallallahu alaihi wasallam) said: "Whoever acquires knowledge in order to compete with the scholars or to dispute with the ignorant or to attract the attention of people -then the Fire! the Fire!" Knowledge is acquired by studying 16 , then implementing it for Allaah's pleasure because He has ordered it and made it a means by which the truth is manifested. The first of the people who will be thrown into the Fire will be from amongst those who acquired knowledge and recited the Qur'aan for others besides Allaah, hoping that it might be said: He is a scholar or, it might be said, he is a reciter. 17 There is no power nor might except with Allaah! This shows the virtues and benefits of knowledge which are from the signs of goodness, happiness and success, that if Allaah wants to show goodness to His slave He gives him the understanding of the Deen so that he can distinguish truth from falsehood and guidance from deviation in order to recognise his Lord by His names, attributes and His great rights, so that he knows the recompense of the friends (awliyaa') of Allaah and His enemies. The reward of the friends (awliyaa') of Allaah is Paradise, near to their Lord, looking at His Face 19 in a place of esteem. The destination of the enemies of Allaah is in a place of torture, punishment, humiliation screened from seeing Allaah 20 . Thus we come to know the excellence of knowledge, that it is the best and most noble thing for anyone who seeks it with the correct intention because by it he comes to know the best and greatest obligation which is worshipping Allaah in His Oneness (Tawheed) with sincere devotion. This knowledge makes him aware of what Allaah has made incumbent upon His slaves, which is a great obligation. There is no happiness nor salvation for a slave of Allaah except through Him, then through the knowledge of these obligations, holding fast to them and being upright. The scholars who disseminated the knowledge are the chosen people and the best of people on the face of this earth. At the head of them are the prophets and the messengers. They are the prime example to be followed, the foundation of da'wah, knowledge and excellence. After them are the people of knowledge at different levels: the person who is most knowledgeable with regards to Allaah, His names, His attributes and most perfect in action and da'wah, is the closest of people to the prophets with respect to their status and position in Paradise. The people of knowledge are the leaders of this earth; they are its lights and lamps; they have been preferred above everyone else, they direct the people to the way of happiness, they guide them to the means of salvation, they lead them to that which pleases Allaah, the Majestic and Sublime, and to His Mercy and keep them far from that which evokes His Anger and punishment. The scholars are the heirs of the prophets 21 ; Imaams of the people after the prophets; they guide and direct the people to Allaah and teach them His Deen; and they have noble manners and praiseworthy attributes. They are the scholars of the truth; scholars of guidance and successors to the Prophets; they fear Allaah much and are constantly checking their actions, and pay great importance to what He orders and forbids. These are their great characteristics because they have trod the path of the prophets, followed their way in calling to Allaah, upon knowledge, in warning the people from the ways that cause His Anger, in striving towards the good sayings or actions that they have knowledge of. After the prophets they are the example (and model to be imitated) in their great characteristics, praiseworthy attributes and excellent deeds. They teach others and act accordingly and guide their students to the most noble manners and to the correct path. As previously mentioned knowledge is "Allaah said..." and "The Messenger (sallallahu alaihi wasallam) said...", which is called Ilm Sharh; it is the knowledge of the Book of Allaah and the Sunnah of His Messenger (sallallahu alaihi wasallam) and all that assists its understanding. It is incumbent upon the people of knowledge that they adhere to this great principle, call the people to it and direct the students to it, making sure that the objective is always "Allaah said..." and "The Messenger (sallallahu alaihi wasallam) said...", acting accordingly, directing and guiding the people to it. Division and disputes are not permissible, nor to invite people to join one group or another, nor to take the opinion of this person or the sayings of another. Rather, it is mandatory that the call is one: the Call to Allaah and His Messenger (sallallahu alaihi wasallam); to the Book of Allaah and the Sunnah of His Messenger; not to the madhhab of this person or the da'wah of the other; nor to this person's group or the opinion of another. It is incumbent upon Muslims that their way and their goals are one -and that is adherence to the Book of Allaah and the Sunnah of His Messenger (sallallahu alaihi wasallam). As for what yields from the differences amongst the people of knowledge in the four schools of thought and others 22 , then it is compulsory that you take from them that which is closest to the truth. That is the saying which is closest to what Allaah has said in the Qur'aan and His Messenger (sallallahu alaihi wasallam) in the hadeeth, or to that which the principles of the Sharee'ah necessitate. This is the way of the scholars, as it was the way of the Companions -who are the scholars after the Messenger (sallallahu alaihi wasallam). They were the most knowledgeable of people with regards to Allaah, and they were the best of people and most perfect in knowledge and manners. They also differed in some issues, but still their call was one and their way was one, calling to the Book of Allaah and the Sunnah of the Messenger (sallallahu alaihi wasallam). Likewise, those who came after them, like the taabieen and the tabaa-taabieen such as Imaam Maalik, Aboo Haneefah, Ash-Shaafi'ee, Ahmad and other scholars of guidance such as al-Awzaa'ee 23 , ath-Thawree 24 , Ibn 'Uyainah 25 , Ishaaq ibn Raahawaih 26 and their equivalent from the people of Knowledge and Eemaan. Their da'wah was one: calling to the Book of Allaah and the Sunnah of His Messenger (sallallahu alaihi wasallam), they forbade their students from taqleed 27 saying: "Take from where we took," meaning the Qur'aan and the Sunnah. Whoever is ignorant of the truth, then it is compulsory upon him to ask the people of knowledge who are recognised with knowledge 28 , merit, correct aqeedah, and biography of the Prophet (sallallahu alaihi wasallam). He should respect the scholars, acknowledge their superiority and supplicate for them in abundance for success and great reward. They have preceded him in great blessing. They taught, guided and clarified the way. The Companions of the Prophet (sallallahu alaihi wasallam) and those who followed them from the people of correct knowledge and belief have the favour of knowledge and da'wah. He should realise their status and merit and overlook their mistakes, taking them as an example in seeking knowledge and in calling to Allaah, giving precedence and priority to the sayings of Allaah and His Messenger (sallallahu alaihi wasallam) in spite of others, being patient upon it, and running towards righteous actions. He follows them in all these aspects and overlooks their mistakes. However clinging stubbornly and fanatically to one of them is not permissible. Nor to say: "His saying is absolutely correct," rather one should say, "Everyone at times errs and at times is correct." What is correct is that which is in consonance with the sayings of Allaah and His Messenger (sallallahu alaihi wasallam) and consensus of the people of knowledge. If the scholars differ then it is compulsory to return to Allaah and His Messenger (sallallahu alaihi wasallam). This is what the scholars have said in the past and the present. It is not permissible to cling fanatically to the opinion of Zaid or 'Amr 31 , likewise it is forbidden to stubbornly attach yourself to one group or party -these are all from the recent mistakes which many people have fallen into. It is essential that the goal of the Muslims is one and that is to follow the Book of Allaah and the Sunnah of His Messenger (sallallahu alaihi wasallam) in all instances: in hardship and in comfort, in difficulty and in ease, when travelling and when resident -in every condition. When the people of knowledge differ, then one should look at their saying and support that which is in agreement with the evidence without prejudice against anyone. As for the common folk, then they should ask the people of knowledge and take from them freely whoever is closest to the truth and upright. They should ask them (the people of knowledge) about Allaah's Deen, then he (the scholar) should teach them and guide them to the truth according to the Qur'aan, the Sunnah and the consensus of the scholars. A scholar is recognised by his perseverance, his taqwaa 32 and his fear of Allaah, striving to what Allaah has made obligatory and keeping well away from what Allaah and His Messenger (sallallahu alaihi wasallam) have forbidden. These are the characteristics of a scholar, whether he is a teacher, a judge, a da'eeyah, or holds any other occupation. He is obliged to be an example and a model in righteousness; he acts upon his knowledge; has taqwaa of Allaah wherever he may be; and he guides the people to good. He is a good example for his students, members of his family, neighbours and others who know him. They take him, his sayings and his actions, which are in accordance with the Deen of Allaah, as an example. The student of knowledge should take great care about being lazy about what Allaah has made obligatory and from falling into that which He has forbidden -for others will follow him in it. Likewise he should not be neglectful of the sunnah and the makroohaat. 33 If he becomes lazy others will also become lazy. It is important that he takes care in reviving the Sunnah, even though a particular act may not be compulsory, in order to encourage the people to follow it, and to be an example for them. He (the student of knowledge) must keep away from the makroohaat and doubtful matters 34 so that the people do not imitate him. The people of knowledge are shepherds and guides. They should be concerned about society as it is their flock; so it is upon them to carry out this responsibility, whilst fearing Allaah. They guide them to the ways of salvation and prevent them from the ways of destruction; implant between them love for Allaah and His Messenger (sallallahu alaihi wasallam), being firmly established upon His Deen, yearning for Allaah's Paradise and His Mercy, being cautious of the Fire, for it is an evil abode. Warning yourself and others about the Fire of Hell is compulsory. This obligation, first and foremost, falls upon .the scholars and the students of knowledge. They (the scholars and the students of knowledge) strive to please Allaah, refrain from disobeying Him, and call upon Him. They do not exceed the boundaries, but take the middle way. They abstain from those things, which Allaah has forbidden and dislikes, so that the Muslims can take from their example and can be influenced by them wherever they are. Such being their state and manner always. I ask Allaah, the Mighty and Majestic, by His perfect names and attributes to make you and I consistent to that which pleases Him, to purify our hearts and actions, to make us rightly guided, righteous and from among the reformers. I ask Him to make His Deen victorious, and to make His Word supreme. I ask Him to make the leaders of the Muslims do actions that will please Him. I ask that He make the leaders be good towards the slaves of Allaah and towards the countries over which they have been granted authority. I ask Him to correct their advisers, to bless and favour them to rule by Allaah's Law amongst the people, discarding anything which contradicts it. As for the other sciences, they have their own significance and importance, like mining, agriculture, farming and other beneficial industries. Some may be important to learn depending upon the requirements of the Muslims, making it Ford Kifaayah (a collective obligation). The leader of the Muslims should order and help the Muslims to learn what they are in need of for their welfare, and to prepare them against their enemies (kuffaar). The actions of the servant of Allaah will be regarded as worship whenever his intention is correct with sincerity to Him. If he does an action without an intention, then it is from the mubaahaat 36 . I mean the different kinds of permissible industries, i. e. mining, agriculture, farming and others. All of these things are required, along with correct intentions, which makes it worship; leaving the intention makes it mubaah. Sometimes it may be regarded as Fard al-Kifaayah if necessity dictates. It is compulsory on the leader of the Muslims to appoint the necessary people to learn this knowledge; its importance depends upon the situation, which differs according to the intention and the necessity. As far as knowledge of the Sharee'ah is concerned, it is incumbent, since Allaah has created jinn and men so that they may worship and fear Him 37 , and this is not permissible except through Islamic knowledge, knowledge of the Book and the Sunnah, as previously mentioned. It is a duty of the student of knowledge to understand and study the Deen, to learn and reflect upon what Allaah's has prescribed, to know the authentic Salafee 38 'aqeedah which the Prophet (sallallahu alaihi wasallam) was upon, his Companions and their followers in righteousness -which is belief in Allaah, His Messengers, His names and His attributes, believing in them in a. manner which is fitting to Allaah without distortion (tahreef), denial (ta'teel) qualification (Takyeef), or likening (tamtheel -without increase or decrease. This was the approach and the way of the people of knowledge, as it was the approach of the Messengers, their Companions and their successors in righteousness. We ask Allaah to give the students of knowledge success; we ask Him to help and guide them to everything that He is pleased with; and we ask Him to make them a means to guide His slaves and make their condition better. Indeed He is the Majestic, the Most High who has Power over all things. May the prayers and peace be upon our Prophet and Messenger Muhammad ibn 'Abdullaah, upon his family, his Companions and those who followed them in righteousness. This verse shows the superiority of knowledge ('ilm) and its people; the following points can be inferred from this verse: 1 . Allaah chose the people of knowledge (Oolul 'ilm) to bear witness to His Oneness (Tawheed) over and above the rest of His creation. 2. Allaah honoured the people of knowledge by mentioning their testimony along with His testimony. 3. He raised high the status of the scholars by associating their testimony with the testimony of the angels. 4. This verse bears witness to the superiority of those who possess knowledge. Allaah does not make any of His creation bear witness except the upright amongst them. 5. Allaah, the One free from all defects, Himself bears witness to His Oneness, and He is the greatest of witnesses. Then He chose from His creation the angels and the scholars -this is sufficient to show their excellence. 6. Allaah made the scholars bear witness with the greatest and the most excellent testimony and that is, "None has the right to be worshipped but Allaah." Allaah, the One free of all defects and the Most High, does not bear witness except to matters of great importance and only the greatest from Allaah's creation bear witness to this. 7. Allaah made the testimony of the people of knowledge a proof against the rejecters. Thus they are its proofs and its signs, indicating His Oneness (Tawheed). 8. Allaah, the Most High, used a single verb to refer to His testimony and the testimony of the angels and the scholars. He did not use an additional verb for their testimony; thus he connected their testimony to His. This shows the strong link between their testimony and Allaah's testimony, as if He himself bore witness to His Oneness upon their tongues and made them utter this testimony. 9. Allaah, the One free from all defects, made the scholars fulfil His right (that none has the right to be worshipped but Him) through this testimony and if they fulfil it then they have fulfilled and established this right of Allaah upon them. Then it is obligatory upon mankind to accept this testimony which is the means to reach happiness in this life and in their final return (to Allaah). Whosoever takes this guidance from the scholars and excepts this truth because of their testimony, then for the scholars there is a reward equal to them. And none knows the value of this reward but Allaah. 1 Abul-Hasan Sadruddeen Alee bin 'Alaa-uddeen ibn Abil Izz al-Hanafee. He died in the year 792H. 2 Shaykh-ul-Islaam Taqee ud-Deen Ahmad ibn Taymiyyah, one of the great scholars of Islaam, well known for his vast knowledge and piety. He authored many books on a variety of subjects. He died in the year 728H. Imaam lbn Qayyim al-Jawziyyah was one of his students, a scholar in his own right, who has written may useful books. He died in the year 751 H.
3 Soorah Aal-Imraan (3): 18. See appendix on page 25 for some valuable points that can be derived from this verse. 6 This means that He rewards them and forgives them their sins. For a detailed discussion refer to Sifaatullaahi Azzawajal al-Wooridah fil Kitoabi was Sunnati by Ibn 'Abdul-Qaadir. Narrated by Anas bin Maalik (radiyallaahu 'anhu), he says: "A group of three men came to the houses of the wives of the Prophet (sallallahu alaihi wasallam) asking how the Prophet (sallallahu alaihi wasallam) worshipped (Allaah), and when they were informed about that, they considered their worship insufficient and said: 'Where are we compared to the Prophet (sallallahu alaihi wasallam) as his past and future sins have been forgiven. ' Then one of them said: 'I will offer the prayer throughout the night for ever. ' The other said: 'I will fast throughout the year and will not break my fast' The third said: 'I will keep away from women and will never marry. ' Allaah's Messenger (sallallahu alaihi wasallam) said: 'Are you the same people who said so-and so? By Allaah! Indeed I am the one who fears Allaah the most amongst you, and the most pious of you; yet I fast and break my fast, I pray and I sleep, and I marry women. So he who opposes my Sunnah is not from me." Reported by Imaam al-Bukhaaree in his Saheeh. 11 The full text of the hadeeth is as follows: On the authority of Aboo Hurairah (radiyallaahu 'anhu) that the Prophet (sallallahu alaihi wasallam) said: Whosoever removes a worldly grief from a believer, Allaah will remove from him one of the grief's of the Day of Judgement. Whosoever alleviates (the lot) of a destitute person, Allaah will alleviate his lot in this world and the next. Whosoever conceals the faults of a Muslim, Allaah will conceal his faults in this world and the next. Allaah will aid a servant (of His) so long as the servant aids his brother. Whosoever pursues a path to seek knowledge therein, Allaah will thereby make easy for him a path to Paradise. No people gather together in one of the houses of Allaah (i. e. a mosque), reciting the Book of Allaah and studying it among themselves, without tranquilitydescending upon them, mercy enveloping them and angels surrounding them, and Allaah making mention of them to those who are with Him. Whosoever is slowed down by his actions will not be hastened forward by his lineage." Reported by lmaam Muslim is his Saheeh. 13 Shaykh-ul-Islaam Ibn Taymiyyah (rahimahullaah) says: Worship is a comprehensive term for everything that Allaah loves and is pleased with from among the sayings and actions, hidden or apparent. 14 Umar ibn al-Khattaab (radiyallaahuu 'anhu) narrates that the Messenger of Allaah (sallallahu alaihi wasallam) said, "Actions are but by intentions and there is for every person only that which he intended. So he whose migration was for Allaah and His Messenger, then his migration was for Allaah and His Messenger, and he whose migration was for some worldly goal or to take a woman in marriage, then his migration was for that which he migrated." Reported by al-Bukhaaree and Muslim in their Saheehs. 15 Reported by Aboo Daawood in his Sunan, with a sound chain of narration (Ibn Baaz). 16 The Messenger of Allaah (W said, "Knowledge is acquired by studying..." See Shaykh al-Albaanee's Silsilatul Ahaadeeth as-Saheehah (I /605/ 342). 17 On the authority of Aboo Hurayrah (radiyallaahu 'anhu), who said: I heard the Messenger of Allaah (sallallahu alaihi wasallam) say, "...[ Another] will be a man who has acquired knowledge (Ilm) and has taught it and who used to recite the Qur'aan. He will be brought (on the Day of Judgement) and Allaah will make known to him His favours and he will acknowledge them. (The Almighty) will say: And what did you do about them? He will say: I studied knowledge and taught it and recited the Qur'aan for your sake. He will say: You have lied -you did but acquire knowledge that it might be said [of you]: He is learned. You recited the Qur'aan that it might be said [of you]: He is a reciter. And so it was said. Then he will ordered to be dragged along on his face until he is cast into the Hellfire..." For the complete hadeeth refer to Saheeh Muslim, at-Tirmidhee or an-Nasaa'ee. 18 Reported by al-Bukhaaree and Muslim in their Saheehs. 19 The believers will see Allaah in the hereafter, this is the correct belief, Allaah, the Most High, says in the Qur'aan: "Some faces that Day will be radiant. Looking at their Lord." Soorah al-Qiyaamah (75): 22-3 Narrated by Qais that Jaabir said, "We were with the Prophet (sallallahu alaihi wasallam) and he looked at the moon -full moon -and said, "Certainly you will see your Lord as you see the moon and you will have no trouble in seeing." Reported by al-Bukhaaree in his Saheeh. 21 Katheer ibn Qays reported: I was sitting in the company of Aboo Dardaa (radiyallaahu 'anhu) in the mosque of Damascus when a man came, and said: Aboo Dardaa, I have come to you from the City of Allaah's Messenger (sallallahu alaihi wasallam); I have not come for any need (but to ascertain a hadeeth) for I have been told that you narrated it from Allaah's Messenger (sallallahu alaihi wasallam). Aboo Dardaa said I heard Allaah's Messenger saying: He who treads a path in search of knowledge Allaah will direct him to tread a path from the paths of Paradise, and the angels would accord welcome to the seekers of knowledge and all that is found in the heavens and the earth and even the fish in the depth of the water seek forgiveness for the scholar and the superiority of the scholar over the worshipper is like that of the full moon at night over the rest of the stars and verily the scholars are the heirs of the Prophets who leave behind neither deenaar nor dirham. They only leave knowledge as their heritage: so whoever acquires it has acquired a huge fortune. Saheeh: reported by Ahmad, Aboo Daawood and Ibn Maaiah. 1. Imaam Aboo Haneefah, Nu'maan bin Thaabit bin Zowtaa at-Taymee. He was the faqeeh of Iraaq, born in the year 80 H. Yazeed said: " I have not seen anyone more fearful of Allaah and more intelligent than Aboo Haneefah." He died in the year 150 H.
2. Imaam Maalik bin Anas, Aboo 'Abdullaah. He was born in the year 93 H. He was the Imaam of Madeenah. He said: " I did not start to pronounce legal judgements (fatwa) until seventy [scholars] said that I was suitable for that." He died in the year 179 H.
3. Imaam Ash-Shaafi'ee, Muhammad ibn ldrees. He was born in the year 150H. One of his wise sayings is: "If a hadeeth is found to be authentic, then throw my saying against the wall." He died in the year 204 H.
33 Here Shaykh lbn Baaz uses the word sunnah to mean the recommended deeds; one who does such an action is rewarded, but one who leaves it is not punished. The makroohaot (sing. makrooh) are those actions which are disliked; one is rewarded for leaving such an action but is not punished for carrying it out. 34 On the authority of Aboo 'Abdullaah an-Nu'maan the son of Basheer (radiyallaahu 'anhumaa), who said: I heard the Messenger of Allaah ssay: "That which is lawful is clear and that which is unlawful is clear and between the two of them are doubtful matters about which not many people know. Thus, he who avoids doubtful matters clears himself in regard to his Religion and his honour, but he who falls into doubtful matters falls into that which is unlawful, like the shepherd who pastures around a sanctuary, all but grazing therein. Truly every king has a sanctuary, and truly Allaah's sanctuary is His prohibitions. Truly in the body there is a morsel of flesh which, if it be sound, all the body is sound and which, if it be diseased, all of it is diseased. Truly it is the heart." Reported by Imaam al-Bukhaaree and lmaam Muslim in their Saheehs. 35 The full text of the hadeeth of is as follows: 'Abdullaah ibn 'Umar (radiyallaahu anhumaa) narrates that the Prophet (sallallahu alaihi wasallam) said: "Everyone is a shepherd and is responsible for his flock. The ruler is ashepherd and is responsible for his subjects; a man is a shepherd for the members of his household; and the woman is a guardian; and is responsible for her husband's house and his offspring. The slave of a man is a guardian of his master's property and he is responsible for it. Surely each of you is a shepherd and is responsible for his flock." Reported by Imaam al-Bukhaaree in his Saheeh. 36 Mubaahaat (sing Mubaah): permissible actions, i. e. actions for which neither reward nor punishment is to be expected, but which are permissible. 38 The Salafee 'Aqeedah refers to the creed that was preached by the Messenger of Allaah as understood by the Companions, the taabi'een and their students; in accordance with the hadeeth of the Messenger (sallallahu alaihi wasallam) "The best generation is my generation, then those who follow them, then those who follow them." For an excellent exposition of this Creed, refer to Explanation ofthe Creed by Imaam al-Barbahaaree (d. 329H), (AI-Haneef Publications, 1995). 39 Adapted from Miftaahi Daaris Sa'aadah of Imaam Ibn Qayyim al-Jawziyyah, rahimahullaah (d. 751 H).